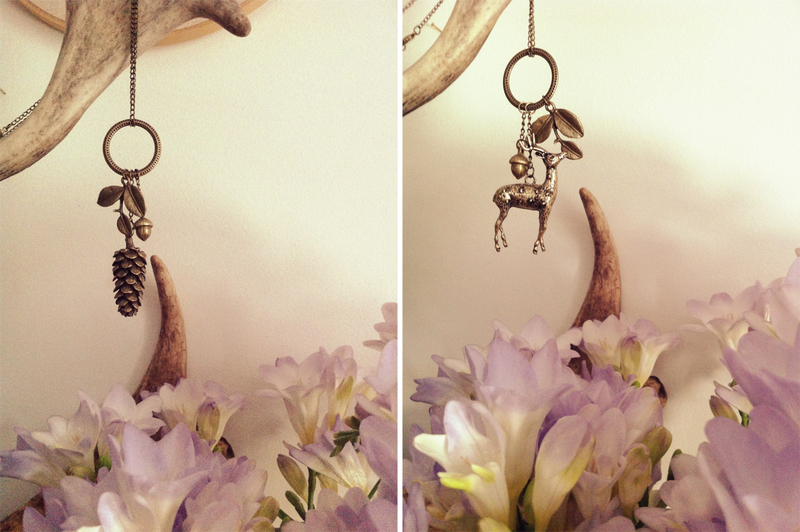 Working on something new and sweet for That Vintage, carrying on with the cluster theme in pendants. So far, two styles will be available - Pine Cone and Deer. 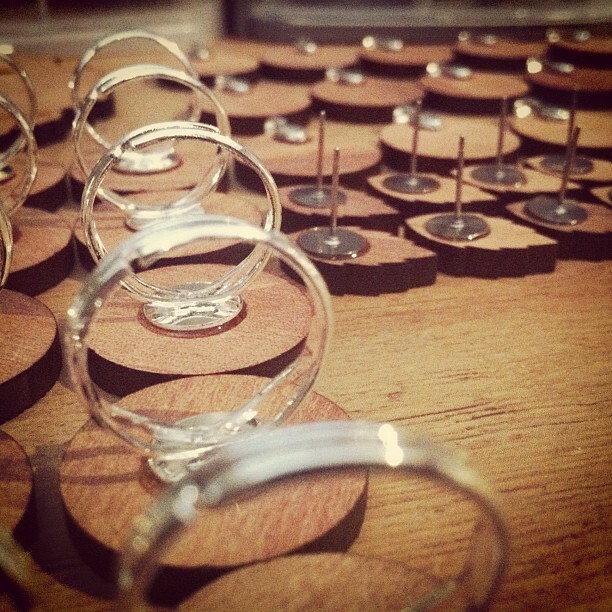 Now, to get the production line in full swing... this may require some fuel, a few iced teas and pistachios should do the trick! Time Out Equals Creative Time. 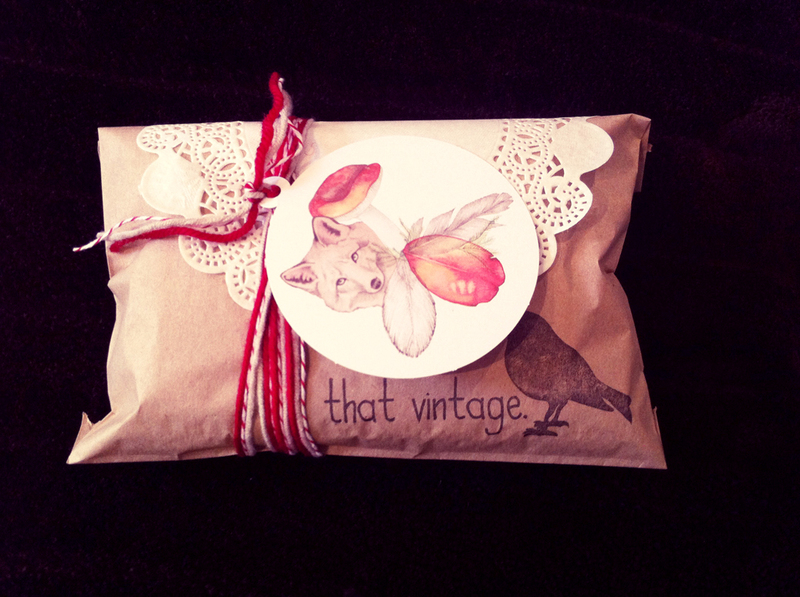 That Vintage has closed the online stores for a little festive break. With the sudden surge of free time on my hands, I have been able to tinker away at something different - something special. 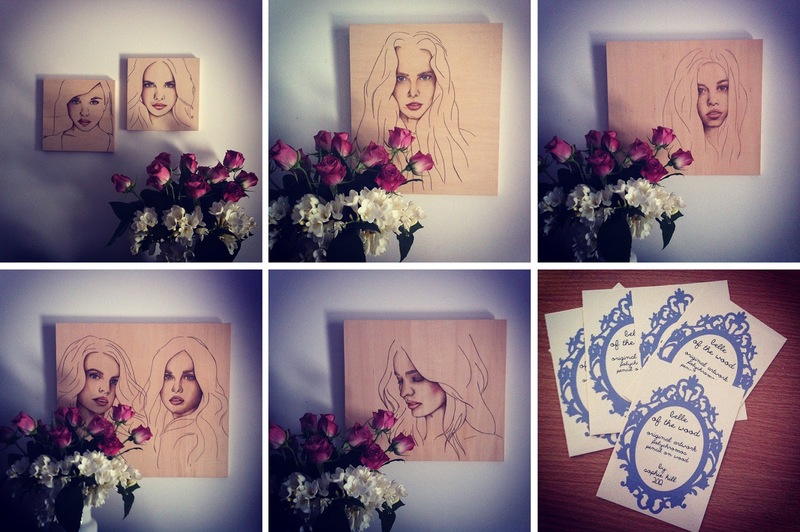 I am proud to announce that I am working with the clever photography duo Clint & Bethanie on a little custom range for them! "Birds flying high... you know how I feel!" Welcome to our family Milky! 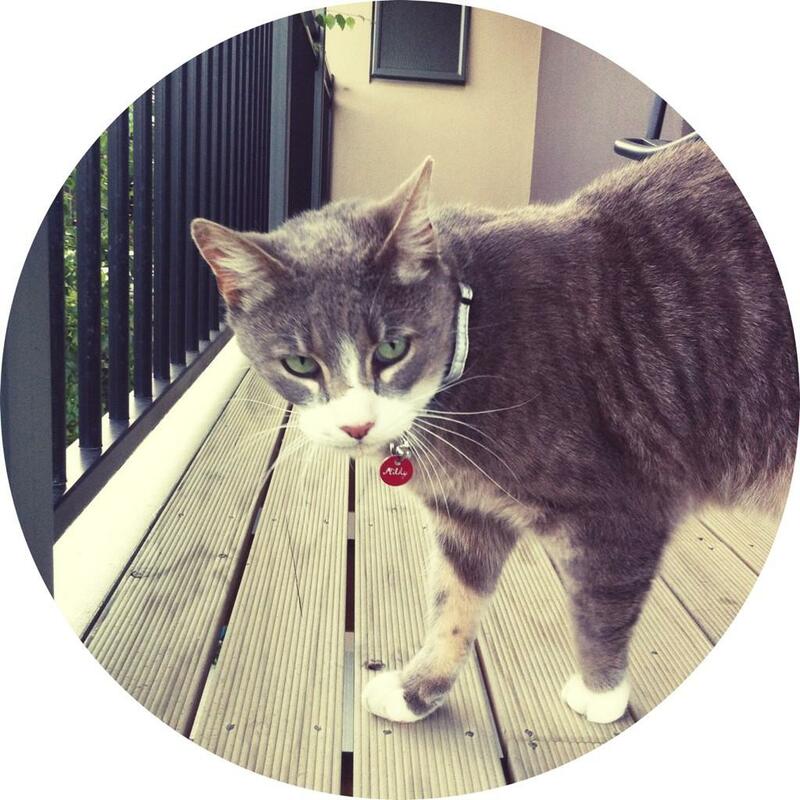 This strapping young lad has been adopted by myself from my dear friend Angela, who has sadly jumped back over the ditch and is relocating her family to New Zealand. Not all is sad as far as I can see, the joy that Milky has given us in the few days he has been living with us will be a constant reminder of the beautiful soul whom I adopted him from. The house feels so good with an animal soul back in it... now we are anticipating the arrival of our little puppy friend in the new year! Furry friends are the best! Can you believe it? Another year is almost up? As I wrap up the last of the online sales for the year, I am getting a little bit reflective and thinking back over the past twelve months. The journey to Melbourne to attend Finders Keepers in the beautiful Exhibition Building at Carlton Gardens, the freezing weekend down at the Seaport for the Apron Design market, the month off both "jobs" and finding my drawing mojo again, the Niche Market in Hobart and Launceston, supplying new stockists and re-filling the old faithfuls, meeting new customers and catching up with the loyal ones... it has been such a whirlwind year, a truly satisfying year. I look forward to seeing what happens with That Vintage in 2013... but for now, thank you to everyone who has supported That Vintage this year and thus far in its journey. It'll be five years next February, this calls for celebrations! I have a crush on fresh flowers - in particular freesias in white and ombre purple, not only do they look stunning, they make the room smell delicious! 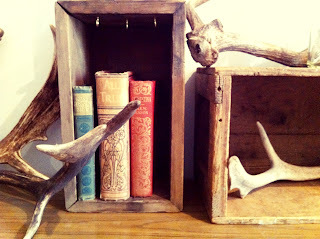 I have a crush on deers, birds, vintage wooden crates, vintage glass jars, pine cones, naturally shed antlers and old books. These are just a few of the things that I have chosen to decorate my bedroom and studio with - all positioned on a very cool retro buffet unit, which homes my ever growing tea cup and saucer collection. I think it is important to surround yourself with the things that are visually pleasing and inspiring, particularly if you spend a lot of time in one space! I have a soft spot for sweet paper goods and my latest crush is Australia's own Bespoke Letter Press - divinely made gift tags, wrapping paper and personalised stationery. 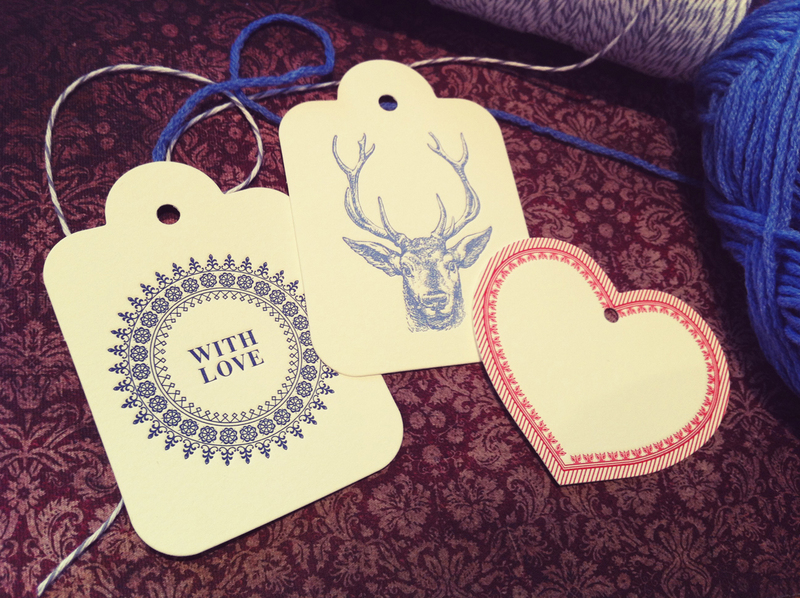 I have recently been adding a tag to some That Vintage orders - not writing on the back, so that my lovely customers can reuse the tag! 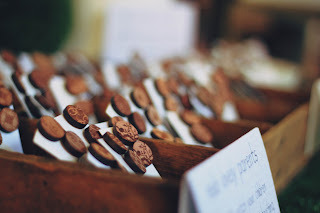 Check out Bespoke Letter Press online and also, they have free postage for orders over $20.00 until Friday 14th December 2012 - what a sweet deal! 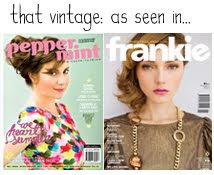 Since That Vintage began in 2008, it has opened my eyes to the world of handmade and small business. The discovery of websites such as Etsy and Made It, has seen me part with more of my dollars than I would normally spend - and I don't have buyers remorse one little bit! Buying handmade has a great, warm and loving feel about it - the thought that someone has put countless hours into designing, crafting and creating, photographing, marketing and packaging makes the purchasing just that little bit more exciting! My little wrapping station for orders (and gifts!) is over flowing with washi tapes, twine, coloured yarn and thread, lace pieces, handmade clay tags, paper doilies, gift tags and wooden beads - from which I have all purchased either locally or from small businesses on Etsy - I intend to keep this trend going for years to come! I hope this inspires you to think outside the box when it comes to your Christmas and gift wrapping, also where your dollars are being spent - have fun with it, enjoy it and think of the greater impact your spending has on the small business world! 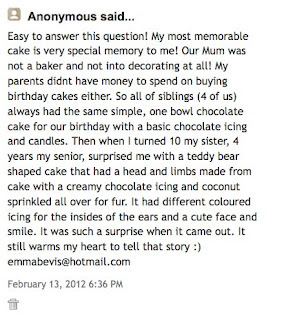 Nothing makes me more happy than the lovely people who fall in love with a piece of That Vintage. Check out the Happy People photo album on the Facebook page! 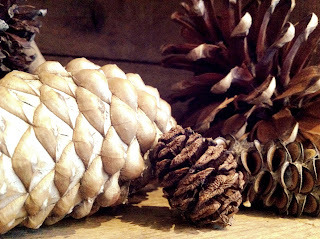 Yesterday marked the last day of Niche: All Wrapped Up market for 2012 and what a beautiful market day to end on! It was an incredibly warm day here in Launceston, but thankfully the market rooms were air conditioned so shoppers could do their shopping thing in comfort. I spent three solid hours on the Friday setting up my stall, it was a little stressful but for the most part enjoyable! The feedback from customers was so rewarding and reminded me why I love doing what I do - to see the joy it brings to my customers. I am so grateful to have had Natalie helping me out on Saturday and Megan when we ventured down to Hobart for the Niche: All Wrapped Up market at the end of last month. 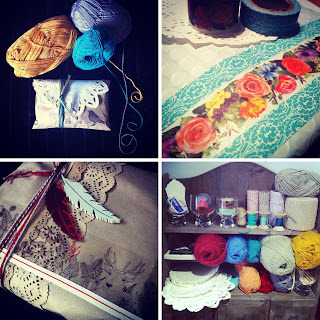 If you'd like to see some more photos of the That Vintage stall please check out the album on the Facebook page. This post is my first since July, whoops! I have a very good excuse, I have been busy - I have been focusing on the online stores, the "brick & mortar" stores that give That Vintage a physical home, preparing for markets, having gigantic Facebook based sales and drawing a lot more! 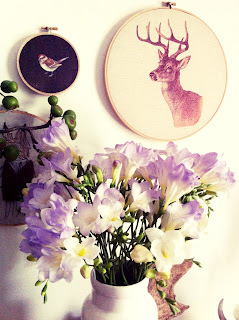 I hope to update the blog with many pretty pictures and recent goodness in the world of That Vintage very soon. For now, I hope you are all well and loving life to the full. Would love for you to say hello and tell me what is news in your world in a comment below! Yesterday, I was standing before a perfectly lined up colourful display of pencils. I was overwhelmed and excited by all the colours but at $2.95 each, I couldn't justify one of every colour as there were easily over 50 to choose from! I settled for six, knowing I'd be back to add more to the collection. I'm not sure what I was thinking when selecting the colours - two browns, two blues, orange and red. Normally I'd play it safe and opt for as many skin tone or neutral shades as possible, but this time I am glad I didn't! 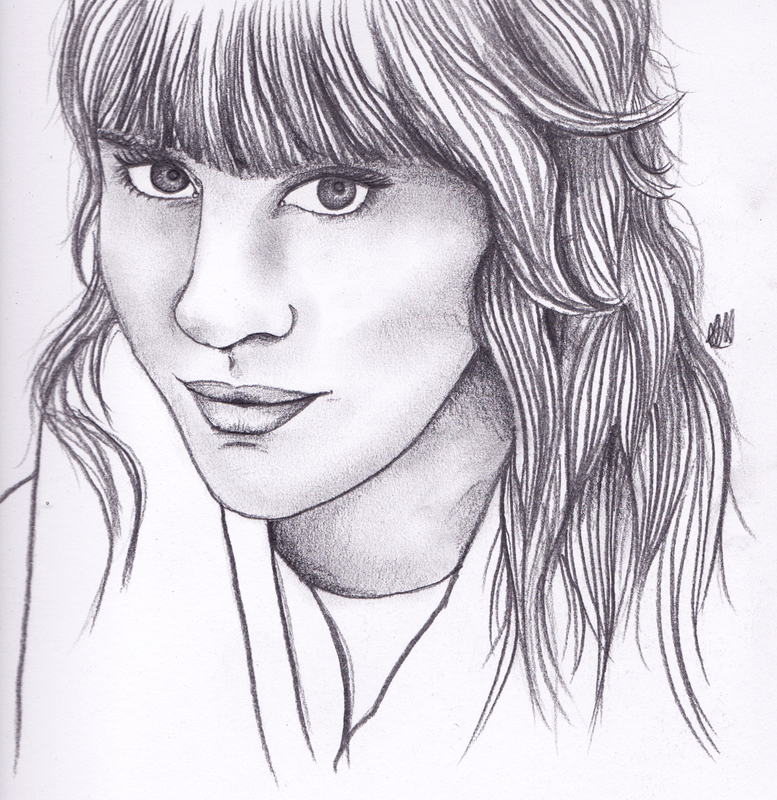 I didn't plan to do a drawing in particular with the pencils. I left them sitting on my desk, occasionally I'd pick one up and gradually shade in a piece of note paper - I was tentative about using them. Until this afternoon! 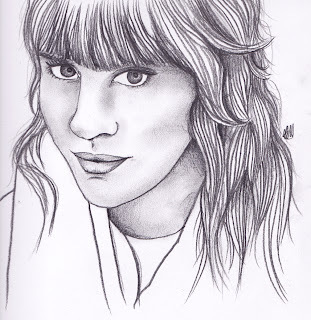 I broke my comfort zone and the below drawing was the outcome - not a graphite in sight! As you can see, the pencils I purchased a fortnight ago are certainly getting a work out at the moment and boy, does it feel good! After packaging up some jewellery orders this afternoon, I grabbed the sketchbook and pencils to begin another piece. 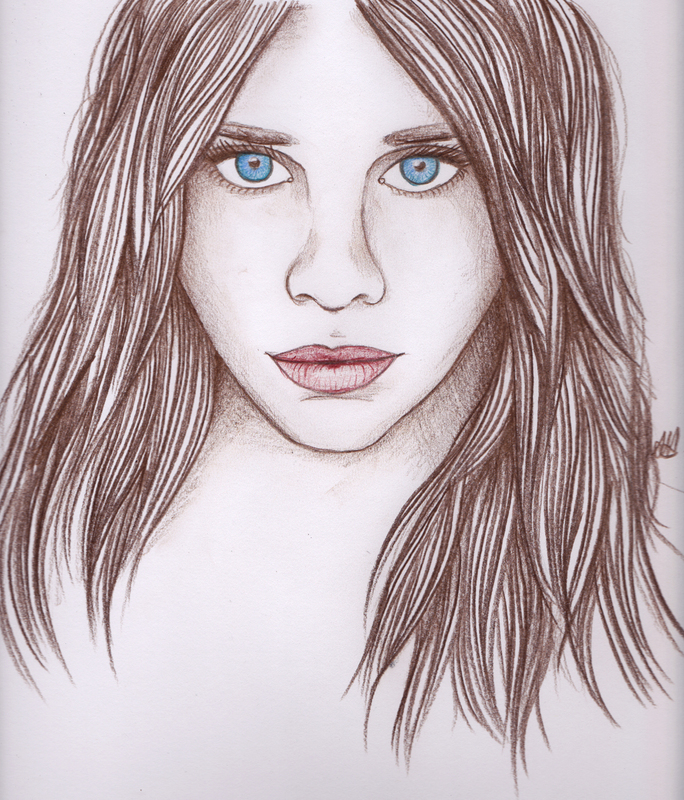 This drawing is inspired by one of my favourite bloggers, Elsie Larson from A Beautiful Mess. Two things that go hand in hand at the moment within my life: tea and pencils. 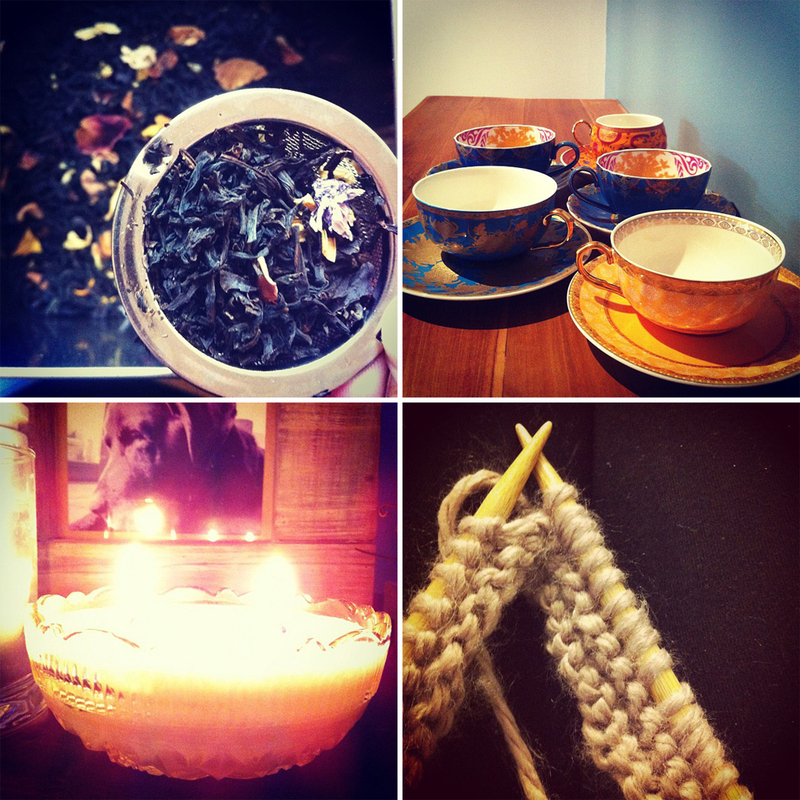 Tea - from Creme Brulee to Gorgeous Geisha. Pencils - from HB to 6B. I purchased a new sketchbook the other week and have made it a nightly ritual when having some alone time, to pour a cuppa and draw. I'm excited by the idea of filling this sketchbook right up with pencil drawings - something I haven't done in a very long time! A couple drawings snapped mid way through. 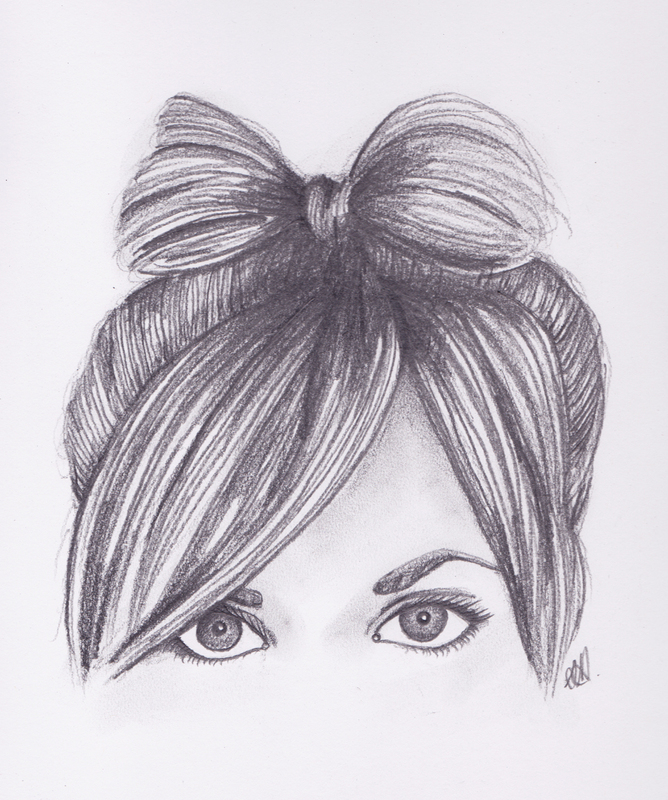 A piece I worked on tonight - a hair bow! I adore it when people find That Vintage in photographs and are thoughtful enough to contact me and let me know - thanks to Julie from tractorgirl, I got to see two pieces of That Vintage worn in a beautiful 1950's themed wedding: the Winter Woods Part II Pendant and the Winter Woods Part II Earrings. 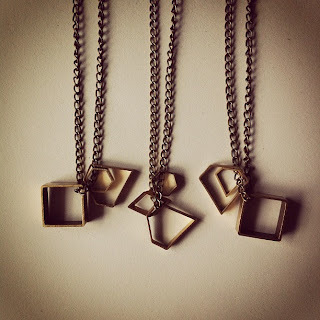 I remember when Shannon contacted me on Etsy and purchased these pieces - I was (and still am!) tickled pink that she wanted to wear them as apart of her wedding day! 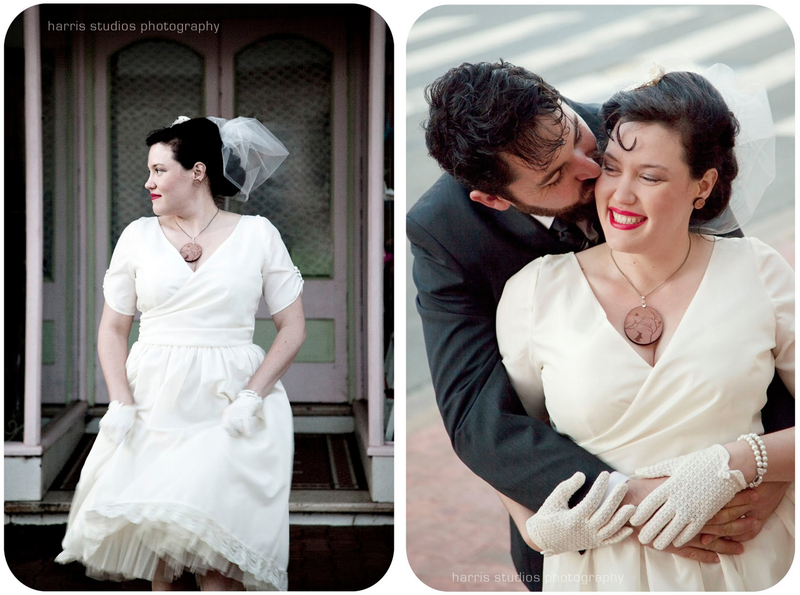 The photographs are gorgeous, what a beautiful theme for a wedding and don't Shannon & Patrick look oh-so in love! Photography by Harris Studios Boutique Photography - check them out! Tea Flavours - so much tea, as you can tell from previous posts, I drink tea. So much tea! Lately I have fallen back in love with French Earl Grey and Madagascan Vanilla by T2. 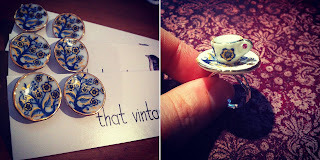 Tea Cups - I pulled my collection of the Turkish Tea Cups & Saucers by T2 out from the cupboard they live in, just so I could enjoy their colours and get them ready for their new home in my 1950's vintage buffet unit that I am picking up from Hobart this coming weekend. Oh they will look divine in it! Photos to come, of course! Sweet Scents & Pet Memories - I've been burning a handmade soy candle that I picked up from last months Apron Design Market - it is set in a vintage ornate glass dish, positioned perfectly in front of one of my favourite photos of my dear pooch Jazz, who we lost almost a year ago - where has that time gone? Miss you every day boy! And my poor Bloss, I miss her so much. Life sure is less amazing without pets. Knitting - It's been 18 years since my grandmother taught me how to knit a rainbow yarn scarf. I don't know how my young mind managed such patience to continue through and finish it, but I know I did! So I took a few Youtube tutorials, purchased new bamboo knitting needles and lovely soft yarn with the goal to make an infinity loop scarf... that means I have to knit 1.4m - wouldn't be such a problem if I didn't cast on in excess of 60 stitches initially! Rookie error! Nevertheless, I am chipping away at it. Since starting this piece, I have bought more needles and yarn in different colours, practiced different stitches and added balls of yarn to a piece. It is true what they say - practice does make perfect! And I have a whole lot more practice still ahead of me! Meet You At The Milkbar. Last Saturday, after a long lazy breakfast and some shopping for a friends' birthday - we headed to Milkbar for a well earned cuppa. I have been meaning to pop into Milkbar - owned by Isis and her partner Damien - since it opened. I don't know why I didn't make it more of a priority, because oh man, it is CUTE! Decked out in retro furniture, a menu full of healthy and delicious goodness, complete with a cute backroom shop and craft area. Milkbar hosts crafty type shindigs - tutorial lessons with crafters for those who want to try something new... you should check out their Facebook page and their Blog... oh and you know what, if you are in their neck of the woods, you should visit them in person. Pick up a loyalty coffee card and tell them I sent you! More pieces of naturally shed White Tail Deer Tips have now been turned into pendants ready for Saturday's Niche: All Wrapped Up market in Hobart. 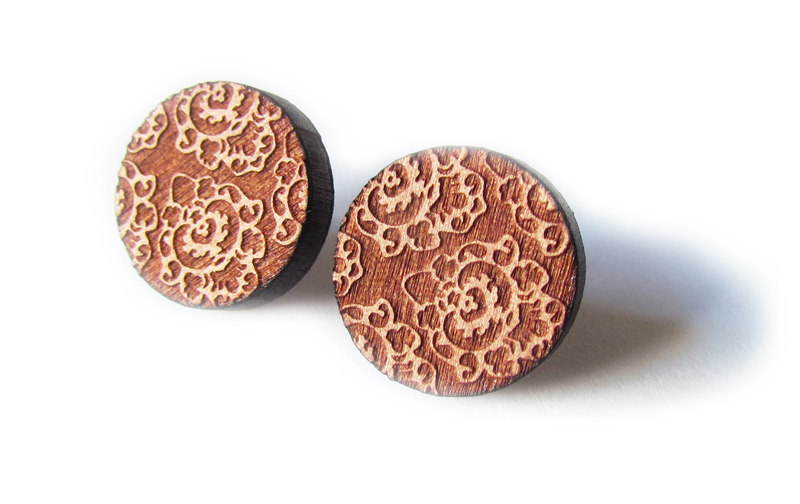 The shapes and textures of these are incredible. Think back to what the Deer Antler is used for - a weapon of dominance and strength between the male deers - it is pretty neat to turn something masculine, into something feminine. Oh I must add that with saying that, I have had a few sales to males! Autumn Colour Bursts in the Skies. 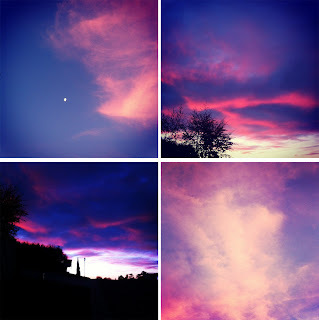 All photos taken by myself on Instagram. One of the reasons why I love Autumn so much is the amount of colour this season brings. Of course I could talk about the obvious colour changes - the leaves morphing from lush greens to deep browns, oranges, reds and yellows... but at dusk, tilt your head back and look to the sky. The candy hues of pink, purple, peach and cream. Delcious. It is hard to believe that Autumn has come and gone. 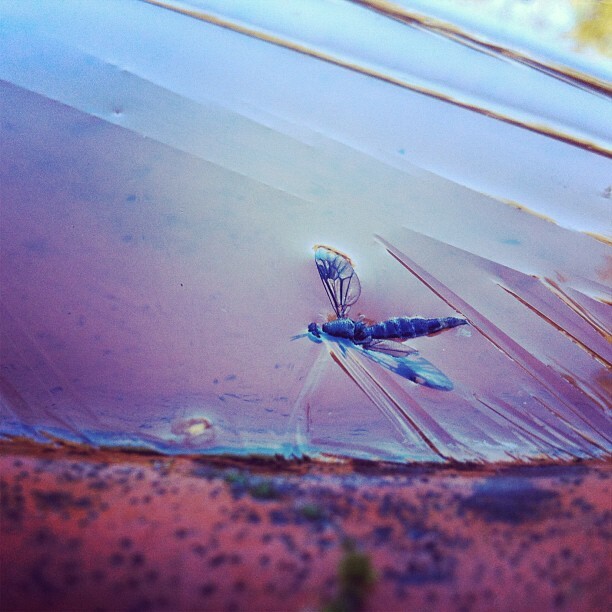 This little guy was frozen in time one frosty morning. Brrr! Now I feel the need for another cup of tea! One of the new additions to the That Vintage family is the White Tail Deer Antler Tip pendants - made from naturally shed deer antlers, these tips are smooth and no two are alike! Available in single pendant or as a trio - if you are like me, you won't be able to stop touching them, twirling them around the chain and stroking the smoothness of the natural bone. Oh, and they certainly are a conversation starter! These will be available at upcoming markets - if you are unable to attend a market, head to the That Vintage Facebook page and get in touch there! Any season is good enough for me to be drinking tea, but Winter certainly encourages more pots to be brewed and more flavours to be tasted. This morning, I took extra long with my breakfast and brewed a giant pot of T2 Madagascan Vanilla tea and served it to myself in this divine mustard, marigold, sunshine tea cup, which is also by T2! It was lovely to just sit, sipping and topping up my cup as it got emptier. Exciting news for Tasmanians... T2 is finally opening up a store in our island state - in Hobart's Cat & Fiddle Arcade - I can see it now, glorious giddy goodness of tea and I'll be making many road trips down south just to visit and stock up! Don't you just love it when you stumble upon someone who sees the world just how you love to? This happened when I was going through my Instagram feed and checking out my recent "likers" - I came across Janelle (greylace) and took a double take when I saw her profile picture... a cute lime knitted jumper complete with a vintage Peter Pan collar and a That Vintage Pair Of Birds brooch! Janelle's Instagram feed is filled with divine sweetness - from cute cups of tea, crochet work and other crafty pieces that she has been playing with. Janelle's blog greylace is spot on the cute factor also - definitely worth a cup of tea and ten minutes (or more!) of your reading time! How gorgeous are the above photos? Shirley is a lovely customer of That Vintage and also a Launceston based doula. 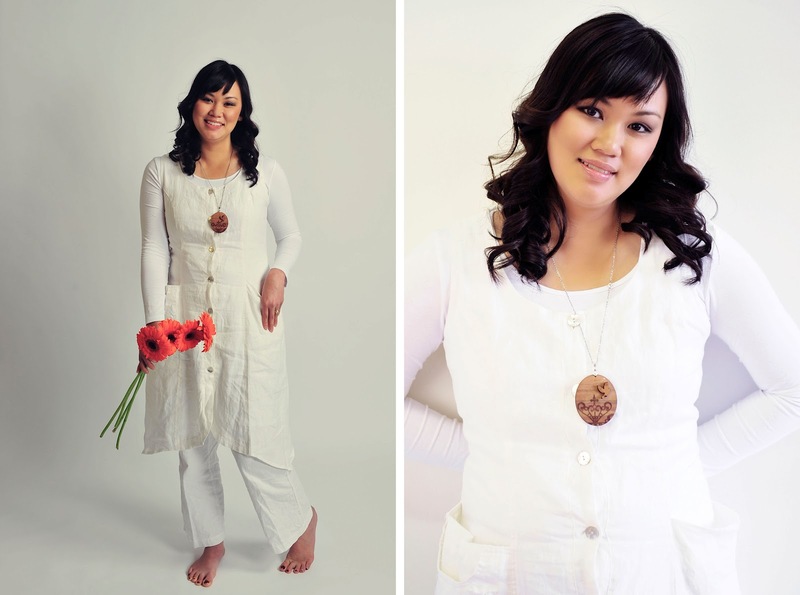 She recently purchased the Iron Dove Pop-Up Pendant and wore it to her photoshoot for her upcoming website - Genesis Births. 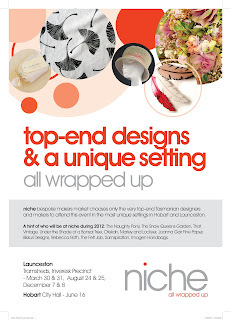 Niche - all wrapped up is heading down south to Hobart for its first ever southern market event! 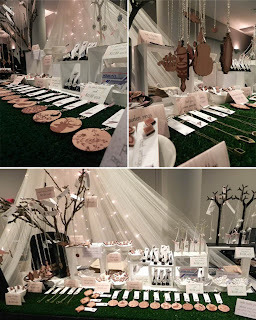 It is the same deal as the popular northern event: a very cool collection of local creative souls, handmade makers, produce and cooking Gods & Goddess' - all with the feel good shopping event, in which 20% of the sales from each stallholder, goes directly to St Giles Tasmania. Oh, it is under cover too - in actual fact, it is in the City Hall! Kudos to that, considering we are well into winter and Hobart is chilly at the best of times! So, see you on Saturday the 16th of June for the birth of Niche Hobart... it's going to be fun! 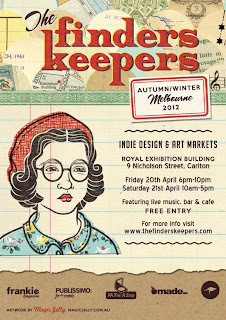 It is crazy to think that Finders Keepers in Melbourne was well over a month ago now, it really feels like only last week! I took a week out of my life and headed across the strait to Melbourne - boxes of stall props were mailed over prior to my departure, destined to my lovely and helpful friend Rebecca. This was such a huge help, it meant that I could take the majority of my stall set up that I use here in Tasmania, to Melbourne. Rebecca also kindly helped out on the stall - which was such a blessing as there were people absolutely every where - it was truly packed out! click for a close up look! On the Friday night, the atmosphere was a buzz with social shopping - lovers of handmade juggling bottles of cider, yummy tacos (that tempted my taste buds greatly!) and their shopping bags - the sounds of awesome indie musicians filled the Exhibition Building, completing the creative scene. Lucky for me, Rebecca's twin Olivia (from Fox & Mint) came along and also helped out! The Saturday was equally as exciting - a huge day and by the end of it both Rebecca and I were exhausted. We both managed to duck away from the stall to do a bit of shopping ourselves, I also got talking to a couple of my followers on Twitter - it was so nice to be able to put real faces to their names! Melbourne, you were great - cannot wait to come visit again soon! 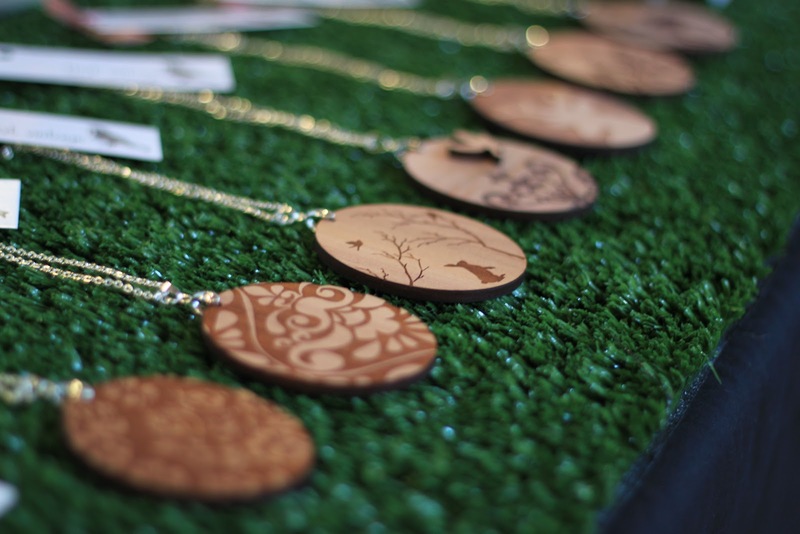 The Sydney Autumn/Winter market is on this weekend - so head to the Finders Keepers website for more information! I have been in that state of mind lately - "must update blog, must update blog" - and every time I manage to get a spare second to begin a post... the phone rings, an important email comes through or my To Do list begs me to attend to something a little more important - I sure do need a clone! 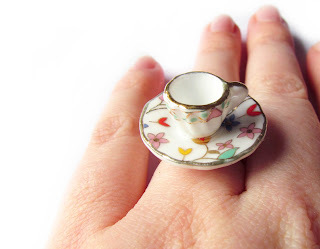 That Vintage Tea Party Cup & Saucer ring in Jasmine print. So, since I last posted, That Vintage jumped the ditch to Melbourne for the Autumn/Winter Finders Keepers event in the beautiful and icon Exhibition Building - it was incredible, jammed packed with an awesome selection of creative folk - but more about that event in another blog entry, complete with photos! That Vintage is now sending all Australian orders via Australia Post Express service - this guarantees a speedy delivery plus a tracking system, all for under $10.00 - hurrah! 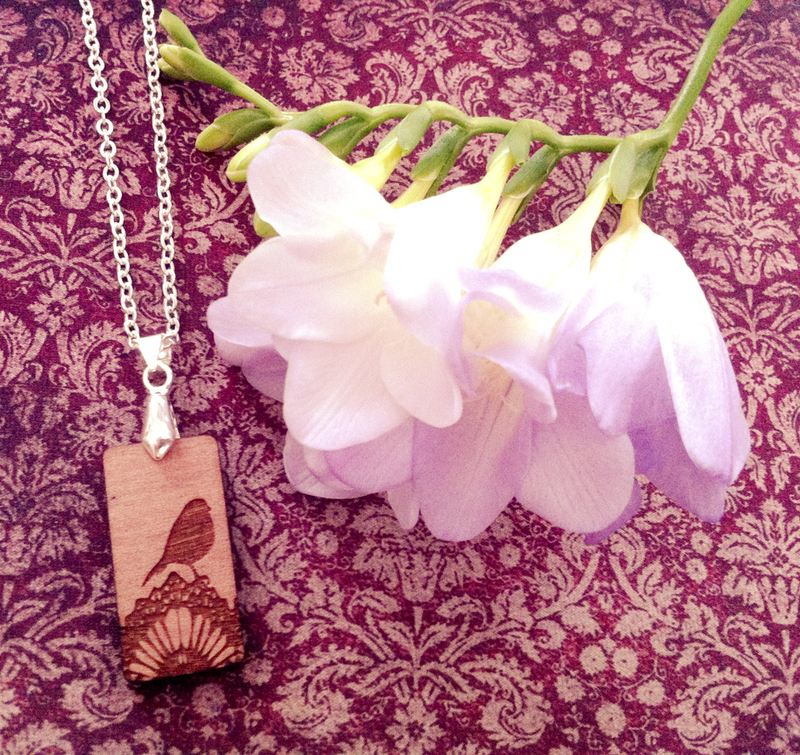 I think having upgraded the postage to Express will offer a lot of online shoppers that peace of mind! 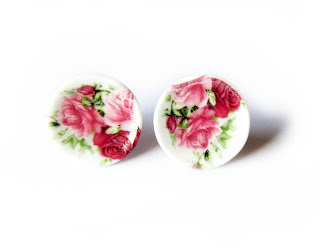 Speaking of online shopping, the Etsy store has had a swarm of new additions - the ever popular That Vintage Tea Party range has finally been photographed and uploaded to the store! Since starting this collection in November 2010 - it has grown in leaps and bounds with new additions to colours and prints including the new Lady Rose and Lady Violet range, large and small saucer earrings and longer chains for the jug and tea pot pendants! Oh yes... the wait is nearly over people! This week is Finders Keepers week! 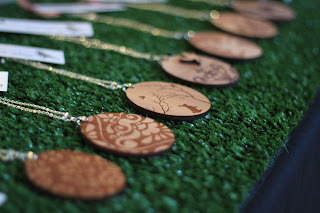 If you haven't been to a Finders Keepers market event, ever, then you are missing out. This even in Melbourne is going to be their biggest to date - with over 120 stalls to make you starry eyed and giddy with handmade goodness - be sure to come cashed up and armed with a tote bag! I love finding old treasures and giving them a new way of existing... I found this really neat vintage soda bottle wooden crate on Etsy - it is now the new display piece for the wooden earrings! One market done and dusted this week... another creeping up on the horizon! 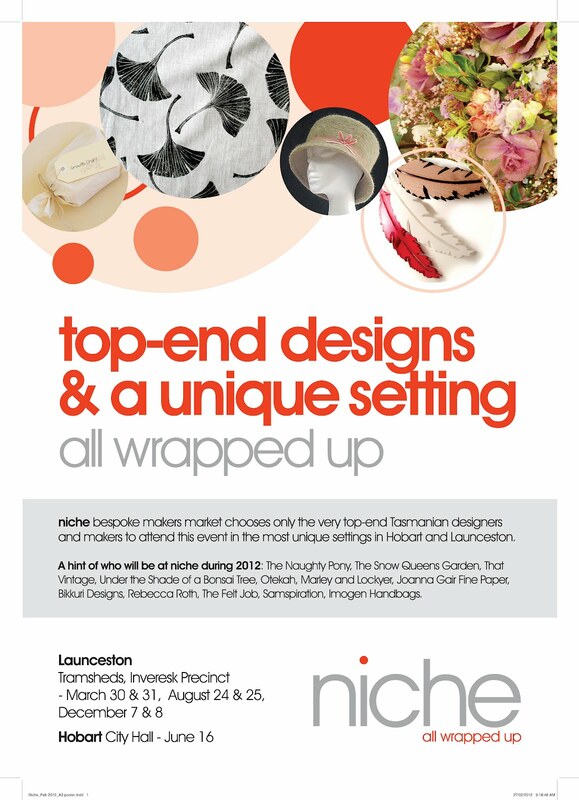 Niche - All Wrapped Up returns to the Tramsheds at Inveresk, Launceston this coming Friday 30th of March 4pm-8pm and on Saturday 31st of March 10am-3pm. More information can be found on the Niche - All Wrapped Up event page. Don't forget about the reason why Niche is in existence... it is a fundraising market event, in which 20% of the profits from each stallholder goes directly to the fantastic organisation that is St Giles Tasmania. 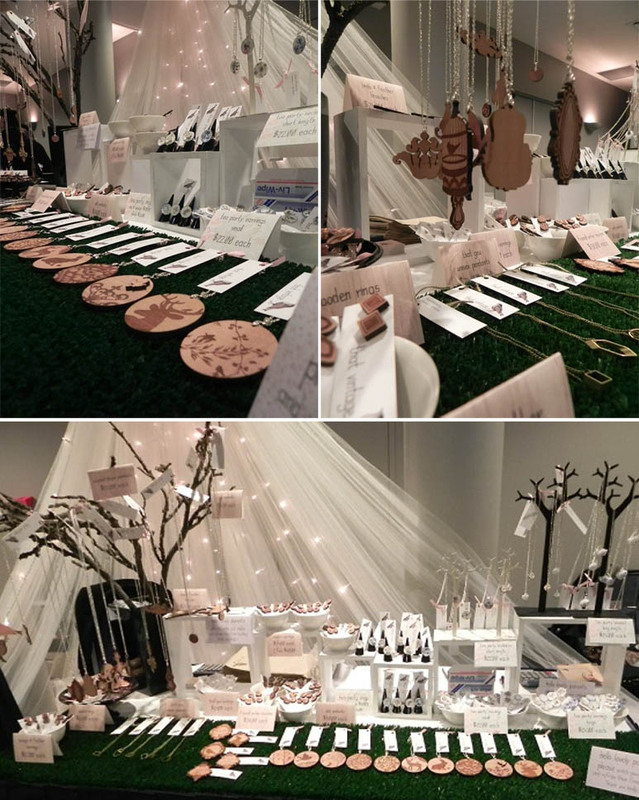 So, it is certainly a good-will good-feel shopping event! Yesterday saw the first market for That Vintage in the cool southern city of Hobart. The Boutique market was lovely, cosy and friendly! It was so nice to put some faces to familiar names and meet new lovers of That Vintage. I purchased some sweet delights from Ruby Macaron... they were received by their recipients with sounds of "oh yum..." "delish!" and the like! Plus I caved in and purchased two beautiful clay brooches from Marley & Lockyer - a grey fox and white wing... I shall blog about these beauties soon! 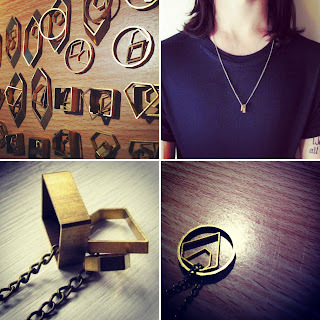 The unisex range from That Vintage is ready to roll and has been available in the Etsy store as a trial run over the past couple weeks - so far so good! These have been fun to make, changing up the combinations, seeing which shapes work best with others and being that mid length pendant makes it a versatile piece for both guys and girls. 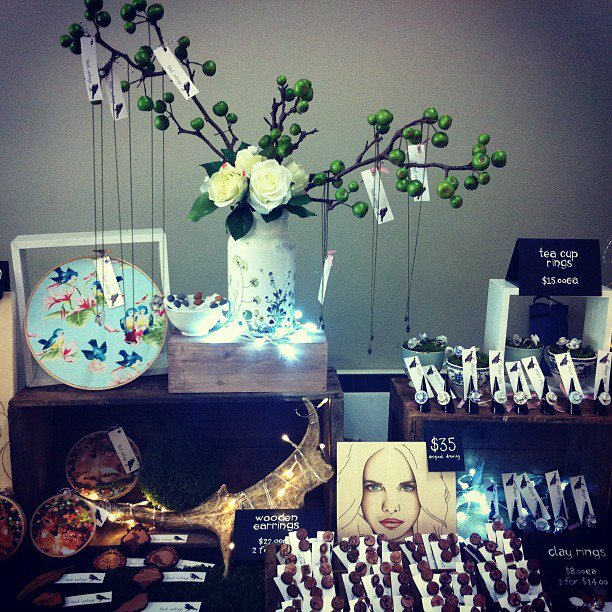 Boutique Market Hobart: Sunday 25th of March, 9am-1pm at the Old Woolstore, 1 Macquarie Street. Niche: All Wrapped Up Launceston: Friday 30th of March 4pm-8pm, Saturday 31st of March 10am-4pm at the Tramsheds, Inveresk. 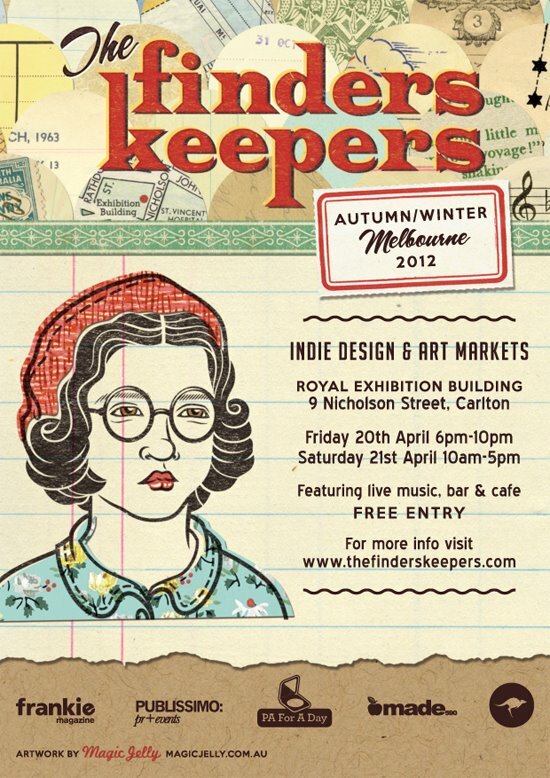 Finders Keepers Melbourne: Friday 20th of April 6pm-10pm, Saturday 21st of April 10am-5pm at the Royal Exhibition Building, 9 Nicholson Street in Carlton. Hello Florence! Newest print in the That Vintage Tea Party jewellery range - and she will be making her debut at this coming Boutique Market event in Hobart, Sunday 25th of March, 9am-1pm at the Old Woolstore. 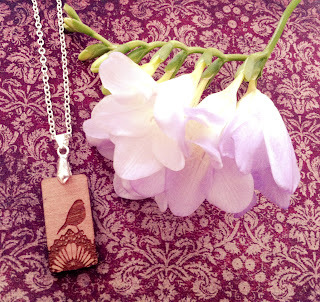 The courier pigeon seems to be a bit generous at the moment - so be sure to take advantage of the feathery generosity and use the above coupon code at the Etsy store before 9pm, Monday 19th of March (Tas time.) - Yay! Hobart, Come Look And See. Only 12 days until the Hobart Boutique Market is on! Sunday 25th of March, 9am-1pm at the Old Woolstore. 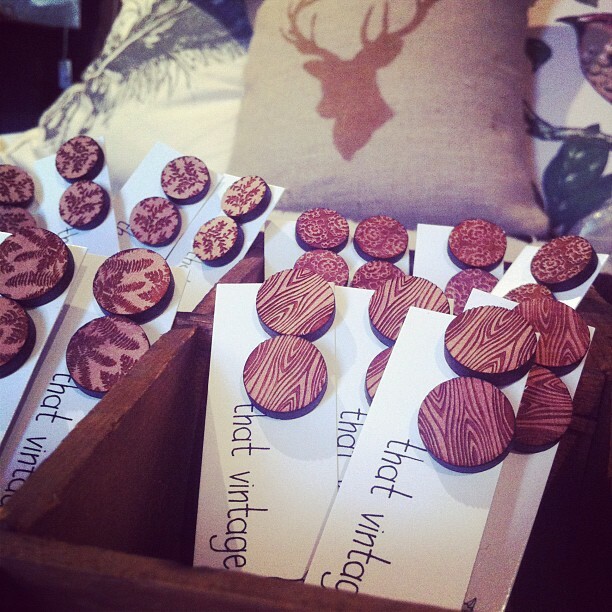 Come and check out all the new goodies from That Vintage, including the That Geo range! I have finally just finished photographing the new That Geo range! It was tricky, raw brass and natural light are not the best of friends, but I hope once I spend the next million hours editing the photos that something good will come from the million I took! So happy to announce that That Vintage will be heading over to Melbourne for the Finders Keepers event, 20th & 21st of April! I cannot wait to hang out with all the creative cats and meet some new lovers and the faithful loyal ones! So much is happening for That Vintage in the coming months, so it is full steam ahead in the studio - yesterday was pendant making day, today it is rings and earrings - plus a few more pendants and brooches. 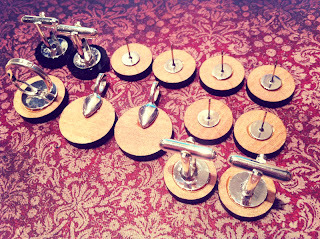 The repetition of doing the gluing side of things I find relaxing, minus the glue fumes - I'm sipping a cup of T2 French Earl Grey tea and listening to the sounds of Warpaint. There is no need for a "Please Do Not Disturb" sign on my door as it is a well known fact that when the door is shut, hands are busy gluing and making and my mind falls into a creative coma... Oh I love what I do! A big warm thank you to absolutely everyone who entered the giveaways and said nice happy birthday wishes to That Vintage! It was a blast... and truly reminded me of the reason why I love doing what I do - because you all love it!